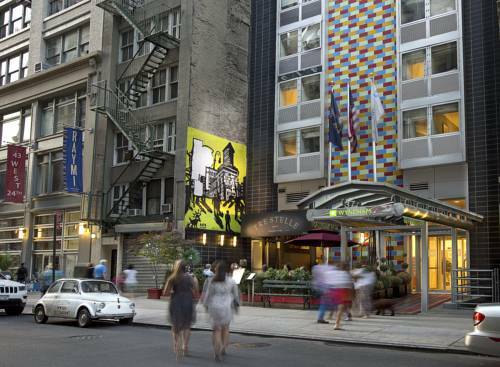 A contemporary urban oasis, the Hotel Henri, A Wyndham Hotel is perfectly located in the thriving neighborhood of Chelsea, providing a relaxing escape in the heart of Manhattan. Easily walk to dozens of restaurants, shops and bars from this hotel. Reach major airports, New Jersey and other boroughs with transportation including nearby subways, taxis and private car services. This smoke-free hotel is also minutes from landmark attractions like Times Square, MoMA, the Empire State Building and the Statue of Liberty. Stay connected to colleagues and loved ones with the complimentary wireless Internet, and keep up with work details in the 24-hour business center. A complimentary off-site fitness center is available. The delicious on-site restaurant serves all meals and room service. The sleek, modern guest rooms feature flat-screen TV, MP3 dock and bathroom with granite fixtures, and select rooms offer microwave, refrigerator and balcony with skyline views.